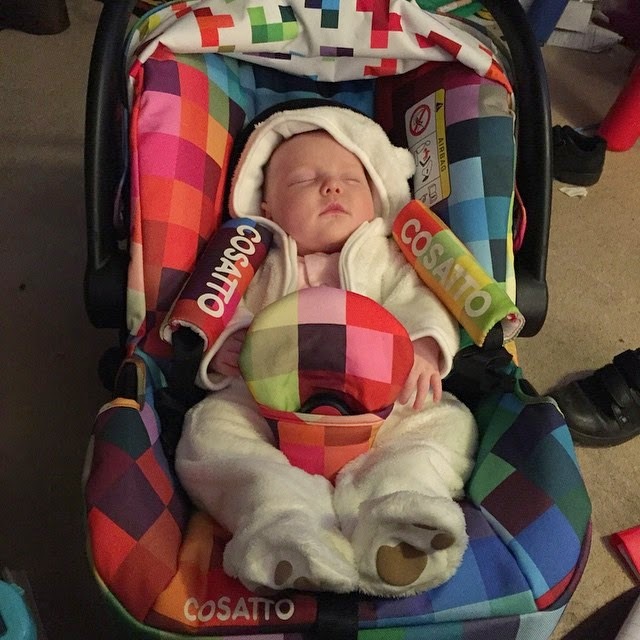 I've been a big fan of Cosatto for a long time and was ridiculously excited when we got the chance to review the Giggle 3 in 1 Travel System a 2 way pushchair, pram and car seat carrier. I love that Cosatto's products are functional and practical but don't scrimp on style. 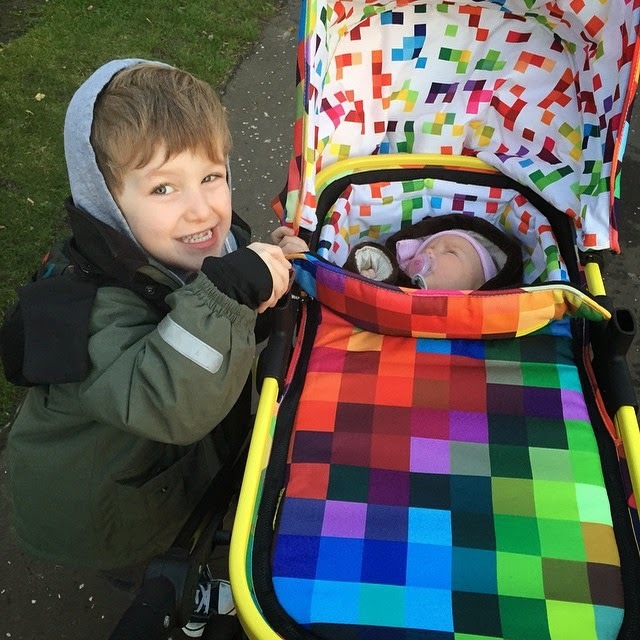 I've got an amazing travel system that suits my family's needs but also looks AMAZING. We chose the pixelate pattern--it's bright, funky and anything but ordinary. I honestly get complimented on it just about every time I leave the house and if I don't I overhear people saying what a gorgeous pattern it is! The pattern isn't just for looking good though as Baby Girl loves staring at the bright colours, too. 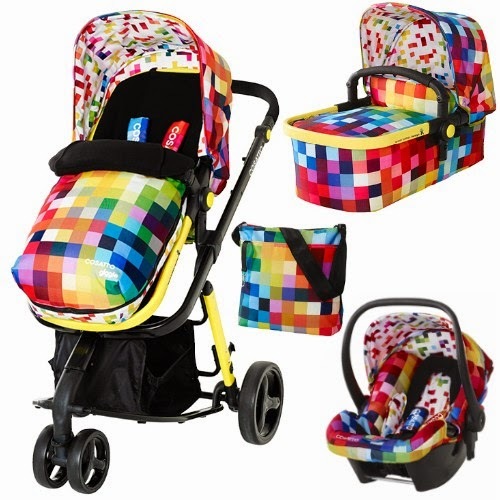 Both the inside of the carseat and pram are patterned as well (something I'd not seen before) and we all know how beneficial it is for babies to interact with bright colours and shapes. So the Giggle looks good but let's talk about how it works. I'll start with the Hold 0+ carseat: I totally love this carseat! It is a bit bigger than the one we had for Blondie Boy but it seems much more comfortable for Baby Girl. One of the best features is how it seamlessly clicks into the base in the car. One of the most frustrating things about carseats can be how long it takes to get in and out of the car, making quick trips that much longer. The Hold base easily installs to the car and then the seat clicks in and clicks out quickly and easily. The Hold can also be strapped in securely with just a seatbelt; it is not difficult at all and can be done one handed, which meant when I was without the car and had to pick up a sick Blondie Boy at school I could strap Baby Girl in to the taxi. The Hold will also click in and work with Isofix fitted cars. The only small downside is that the car seat is quite heavy, particularly with a growing baby in it! Once you are out of the car the Hold clicks directly into the pram base. For me this is ideal as it means when I'm picking up Blondie Boy at school I can get Baby Girl in and out of the car with little hassle. 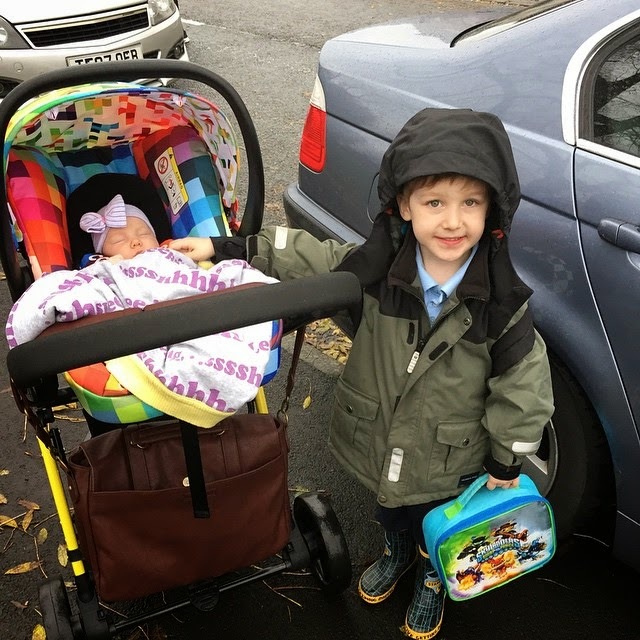 After my c-section and severe SPD I wasn't allowed to carry anything heavy so carrying the car seat was not an option; being able to clip the Hold carseat into the pram base was essential! I can be a bit of a faff getting the Hold in and out of the base. Ideally you'd like one seamless motion but I have it worked out now that I need to clip in one side and then the other side--the same is true for taking the seat out of the base. You couldn't do it one handed but I'm okay with that because it means I know the carseat is secure in the base. The pram base itself is very easy to open up and close down. The base opens one handed using hydraulics although you need two hands to collapse it (it has two buttons plus a safety button)-again you know this means it is safe and secure and you aren't going to accidentally close it while using it. The pram/ cot clips in and out easily. When Baby Girl was first born I wasn't allowed to go up and down the stairs post c-section so she slept in her Giggle in the living room! It is roomy and comfy and I love again that there is pattern inside the carry cot to stimulate your baby. Even though it's spacious for baby, we were able to get the carry cot, pram base and all of Baby Girl's stuff easily into my mother-in-law's trunk when we went to visit. There is nothing worse than a pram taking up all your trunk space but the Giggle can hang out in your boot and still leave plenty of room for groceries or other shopping. The Giggle Pixelate Travel System is available for £430 and the Hold Pixelate Infant Carrier Carseat is available for £125 but for a limited time you get it FREE with any Giggle Travel System! Let's be friends! 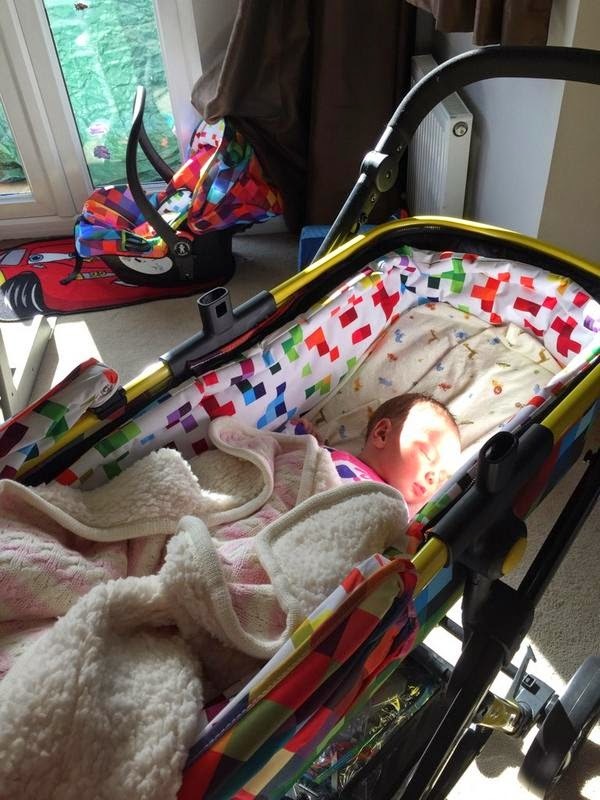 Find me here: Transatlantic Blonde were provided this travel system for review but all opinions are our own. The pattern is the best, right? Wow, love the print, good idea for when they are still little and vision is still developing. i heard about this brand first time. print is cool!